Custom data fields open doors to a variety of advanced features. This week, we are releasing yet another new feature that is directly linked to reports and the custom data fields of resources and projects. In custom data fields, one of the data type is 'Number'. This feature allows you to calculate this number in association with your tasks' Busy Time in reports. Only limited to resources and projects, this feature is perfect for a number of uses. For example, if you set Roger's hourly rate as €50, the report will calculate how many hours he has worked (Busy Time) and provide you with a number of how much to pay him for the duration of the report. This new feature is not an extension, but developed as a default feature in Ganttic's planner. 1) Click on a resource. Click on 'Add new field'. Enter 'USD/hr' as the data label and select 'Number' from the data type drop-down. 2) Click on 'Save' and enter a number in the text field of USD/hr. Click 'Save' again. 3) Open up an existing report. Click on 'Select Report Fields' on the top left. There will be a new data label named 'USD/hr X Task busy time(h)'. Drag the data label into either the grouping level or the details level. Click on 'Apply' to generate the data. The Calculations Feature isn't limited to calculating the hourly rates of resources, but also projects and for various other purposes. Ganttic is essentially a framework that allows you to build your data upon. The ways of using the calculations feature and Ganttic is unlimited. Especially the customization features. To give this new feature a try, sign up or sign in to Ganttic. 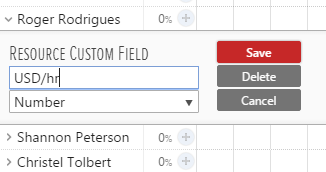 To learn more about custom data fields, stay tuned for the next blog post.